Heysham’s history spans many centuries and its landscape has been the feature of several notable works of art. 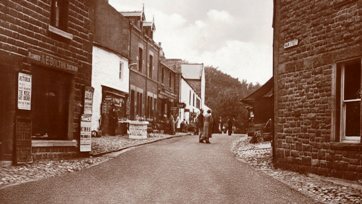 Here we have provided some old photographs showing Heysham Village and the surrounding area from the turn of the 20th century and how village life and local vistas have been depicted by artists. See also images of various groups/societies in Heysham and Heysham Amateur Operatic and Dramatic Society. 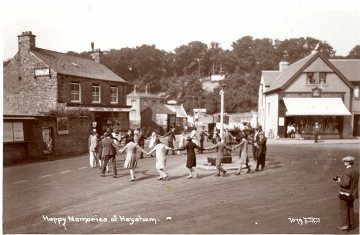 We want to create an archive of images of Heysham and the surrounding area and so we are asking for anyone with suitable photographs or postcards if they could submit the images to us so that we can scan the image and build up the archive. The archive of photos will help to preserve Heysham’s heritage for future generations. 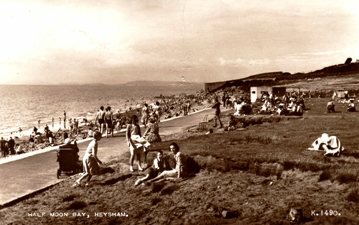 The images could show buildings, village residents, local businesses, the landscape or other aspects of Heysham. The archive will form the basis of a future display. Help us build a picture of Heysham. 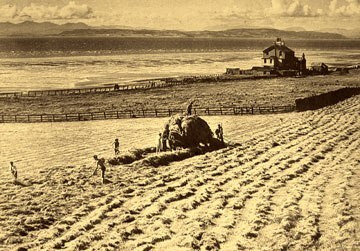 Haymaking in 1945 in the coastal fields to the north of Knowlys Road - a vista enjoyed by residents and visitors alike. Mary Wright, who is here seen in shadow behind the hay wagon, refers to the field as Strawberry Meadow. In 2008, ownership of the field passed to a group of frontagers under a covenant arrangement to retain the open landscape. The new owners have reverted to the 19th century name for the field, Lindale Meadow. The house to the right, known in its later days as Bay Cottage, was demolished in the late 1960s and the site is now a children's play park. On old maps of Heysham the house is referred to as Pot House. This photograph is of Main Street, viewed from the top of the road with the Village Institute on the right. The first poster on the left of the photograph is for the Morecambe Astoria cinema and advertises the film ‘The Music Goes Round’, released in 1936. The poster is displayed outside the premises of AE Bolton, Plumber and Electrician and this building on the left used to house Heysham’s original post office. The building on the left before Royal Fold advertises that it has a ‘Tea Room upstairs’. This picture shows Hadath’s Tea Gardens which were in the grounds of the Old Rectory or ‘Greese Cottage’. The Tea Gardens were established in 1900 although Greese Cottage is believed to have been built around 1664. The name greese is thought to be derived from the Latin gradus meaning steps. The photograph below shows a close up view of Hadath’s Tea gardens. For the full story of Greese Cottage click here. A closer view of Hadath’s Tea Gardens (see above). The proprietor was A. Henderson. 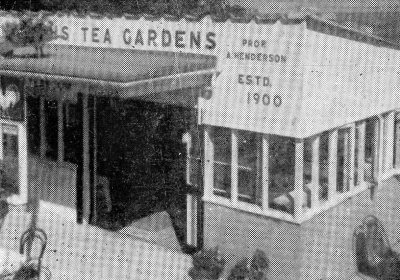 The Hadath’s advertisement at this time stated that the Tea Gardens offered ’Noted Home-made Cakes & Custards, Chicken Teas and Fresh Lune Salmon Teas. Parties catered for’. 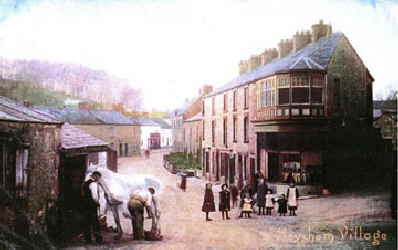 The cottage on Heysham’s Main Street still exists today. This photograph was taken in 1940 at a time when the brewing of nettle drink in Heysham had become widespread. The sign shows the price as 2d per glass. Ice cream is also offered - “Home made daily from fresh milk and cream. Real old fashioned ice cream is still the best”. which contains a scene in Main Street (fast forward to about 7 minutes in.). There are also scenes at St Peter’s and the rock graves just before this. The building on the left was originally a farmhouse (Carr House Farm). A car park and recreational area now occupy the land immediately behind the building. 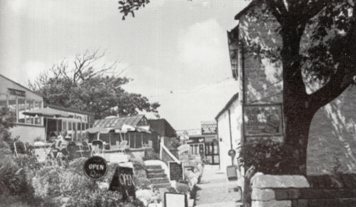 The building on the right of the photograph was Heysham village Co-op shop (now Curiosity Corner Tea Rooms), built in 1923. Heysham Tower viewed from the meadows. The Tower was built by T J Knowlys and stood in thirteen acres of land. It was originally built as a gentleman’s residence. For the story of The Tower in the 19th century click here. 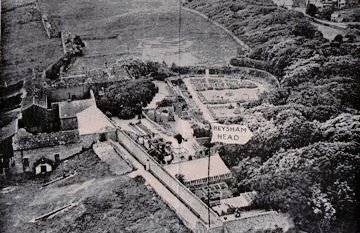 An aerial picture showing Heysham Head Pleasure Resort with its 20 acres of Gardens, Woodlands and Pleasure Grounds. In the centre is the Rose Garden and to the left are the Norman arches of the Middle Terrace. To the left of these was the Upper Terrace where the Aviary and Monkey House were situated. 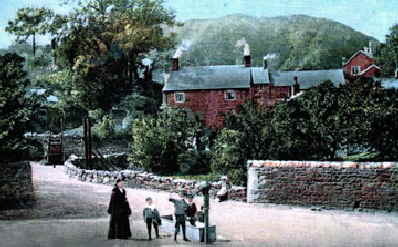 The smithy was at the corner of Carr Lane and this picture (c.1900) gives a view looking down into the square from the bottom of Crimewell Lane. The children are standing in front of what was until recently Heysham Village Post Office. 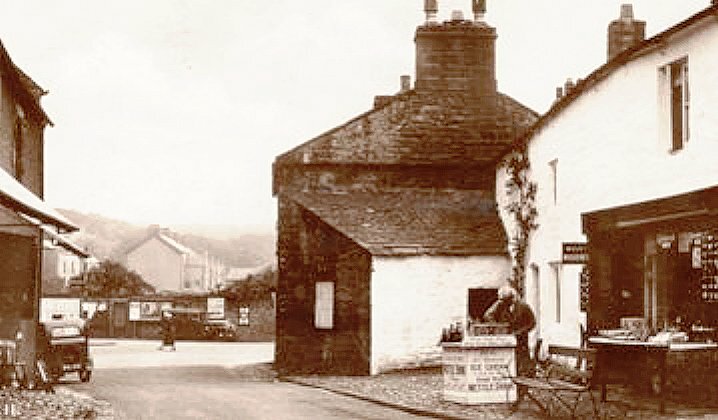 The Village pump was at the junction of Bailey Lane, Knowlys Road and St Mary's Road. It was destroyed in a vehicle accident about 1930. For the past 200 years it had been the major provider of water for the village. 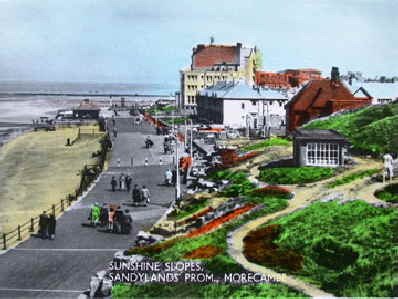 A hand coloured postcard from the mid-20th century showing the Grosvenor Hotel, recently demolished, and the promenade to Sandylands, refurbished in 2007. 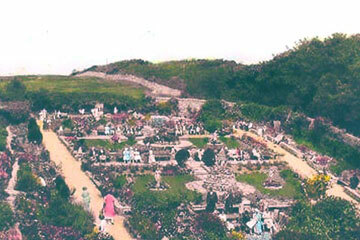 The Rose Garden, part of Heysham Head, was a once-popular attraction where visitors could enjoy concert parties, brass bands, and many other attractions such as clowns, singers and comedy acts. 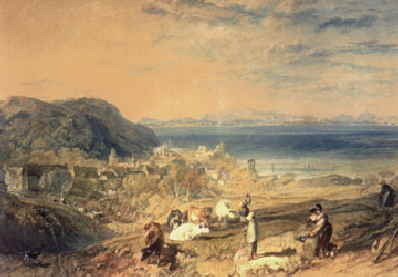 "Heysham and Cumberland Mountains", a painting by J.M.W. Turner (1775-1851), © British Museum. Turner visited Heysham in 1816 and made several sketches which in 1818 he used as a basis for the painting we see here. See local author Peter Wade’s booklet on Turner’s 1816 tour. This image is available as a greetings card from Heysham Heritage Centre. 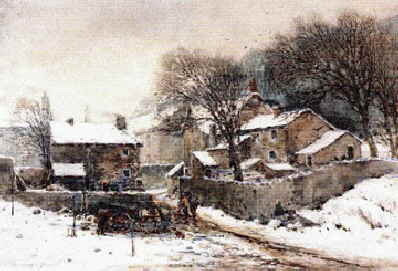 "Heysham in Winter”, a painting by local artist William Woodhouse (1857-1939) . © Haworth Art Gallery, Accrington. 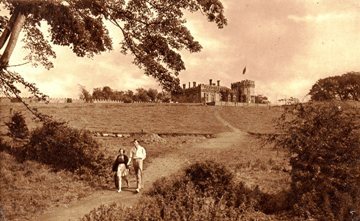 The building on the right is Greese Cottage, which was the Rectory before the 18th century rectory was built; that was extensively refurbished in the 19th century demolished in the 1950s. 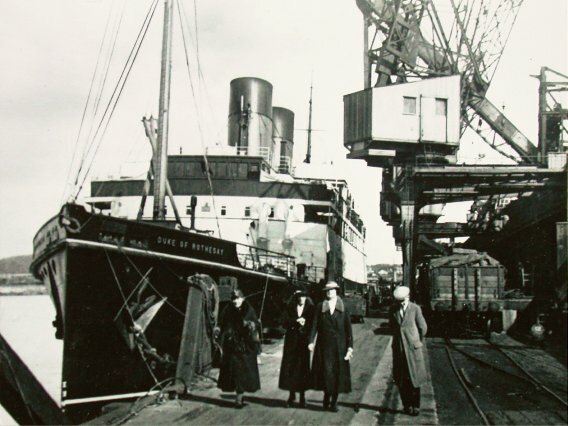 This 1920 photograph of a party of four at Heysham Harbour about to travel (or may have just arrived) on the Duke of Rothesay has just come to our notice not having seen it before. It has been enhanced by Printsalive which is a Lancaster group run by Steve Smith and it is reproduced here with his permission. Perhaps others have seen it before. Enhancing monochrome pictures digitally can produce remarkably good results. Many other monochrome prints on this website have been enhanced in-house.